Eugene Laverty secured a late deal to ride the new Ducati V4 R for Team Go Eleven in the 2019 World Superbike Championship. Eugene Laverty will have to wait patiently for his first ride for new team Go Eleven on the Ducati V4 R Superbike. The Northern Ireland rider sealed a late deal to ride the Italian machine in the World Superbike Championship after being snubbed by Shaun Muir, who is running BMW Motorrad’s official factory effort in 2019 with Tom Sykes and Markus Reiterberger. Laverty has missed the first two winter tests at Aragon and Jerez in Spain and will have to bide his time until January at least to ride his new machine. 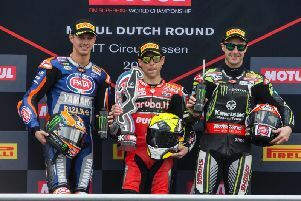 The 32-year-old, who finished as the runner-up in the World Superbike Championship in 2013, said he had been keeping an eye on the progress of the Ducati in the hands of Chaz Davies and Alvaro Bautista this week at Jerez. “It will be a long wait until I get to try the new Ducati V4 R but the lap times of Chaz and Alvaro yesterday made me smile,” Laverty said. The Toome man spent the past two seasons with Muir’s Milwaukee Aprilia team after making his World Superbike return following a stint in the MotoGP World Championship.